We have recently been passed a copy of a photograph with a request for more information, maybe the location or the purpose. A comment with the photo says that the men were in training but didn’t say what for. 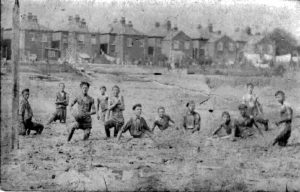 It is not clear if they were training for some military role or whether the man apparently holding a ball meant that it was some form of mud sport. If you can help and do have any suggestions then please contact the HGS Research Center at Cosham.